If you have a Mac computer and you are using latest version of Apple operating system, MacOS High Sierra then you have to take a lot of safety measures. Macs have been infected with an endangering risk that allows unauthorized users to get into your computers without any passwords or security checks leaving all your personal data at stake. This default permits uncertified user to get physical access of your computer, known as “root” without any password. First, open system preferences on machine. Then, select users and groups. Don’t enter anything into the password field and leave it blank. Then press the enter button several times. 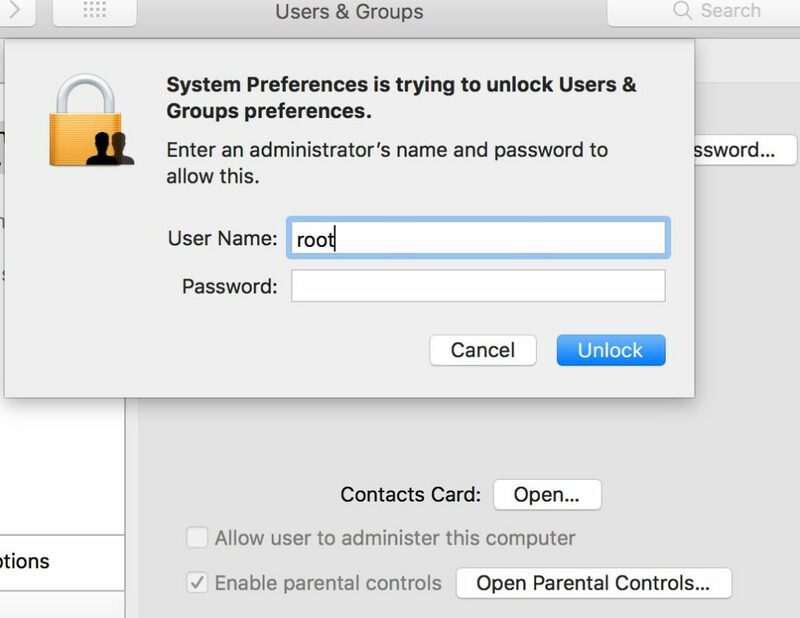 After a few tries, Macos High Sierra logs in the uncertified user allowing them access as “superuser” which permits to read and write to system files. Making use of the MacOS login screen any user can get access to your mac with FileVault trying that root trick. Somehow, it is not near to possible to exploit this endangerment when a Mac machine is turned on, and its screen is secured with a password. A temporary fix has been discovered. To fix this error you need to enable the root user with a password. This password won’t let anyone access your Mac with a black password.